I have written at length about the culinary nirvana that is Ethiopian food, so I won’t repeat myself here (not today, anyway). My uninitiated American friends can find out where to find the good stuff if they scroll to the bottom of this post from my old blog, Foodlandia. Although very few of my American friends are uninitiated because over the years I have dragged almost all of them to an Ethiopian restaurant somewhere. You might want to know that if you should decide to visit us here in Ethiopia, we will drag you to an Ethiopian restaurant here, too. Probably several of them. I suppose you will go willingly because, after all, you did come all the way to Ethiopia to find out what’s the what in Addis. But at least one meal will have to be at what they call a “cultural restaurant” – one that serves the full complement of dishes in the traditional manner. It will also have a dance show. We hosted a visiting author last week at ICS: Bruce Coville, author of (among many other children’s titles) Jeremy Thatcher, Dragon Hatcher. A group of teachers took him to Dimma, the faculty favorite among the cultural restaurants. Bruce (on the right) with some of our ICS colleagues. Watch out when you go to Dimma. They will drag you up on stage where you will dance, Ethiopian style, to the best of your abilities and to the great amusement of your dining party. Then someone will post the video on the Internet. 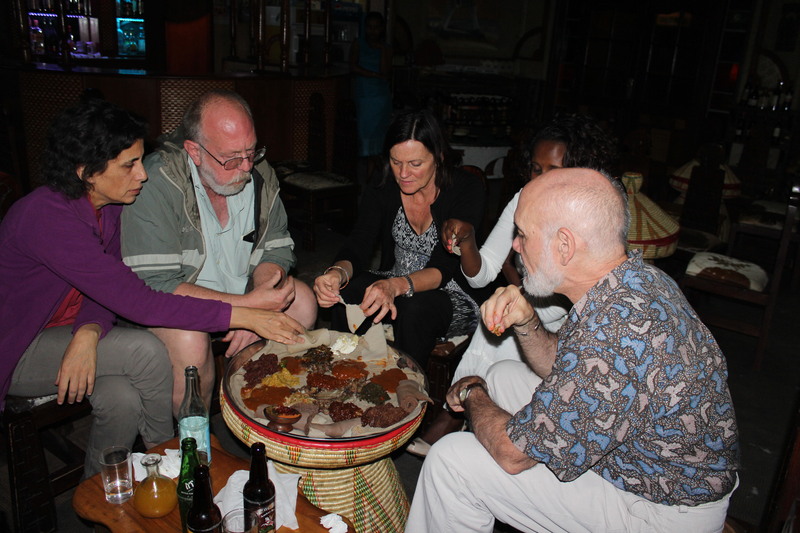 This entry was posted in Addis Ababa, Ethiopia, Family, Food, International Community School, Teaching and tagged Bruce Coville, Ethiopian dance, Ethiopian food. Bookmark the permalink. Ha ha! Great video, Lorna. It sounds like Irish music, especially appropriate since you posted on St. Patrick’s Day.